The following applicants have been selected to join various degree programmes for 2017/2018 academic year which commences on the 30th October, 2017. All candidates selected to join BSc. Environmental Science and Management, BSc. Education, Bachelor of Tourism Management, BSc. Agricultural Education, Bachelor of Rural Development, BSc. Agricultural Economics and Agribusiness, BSc. 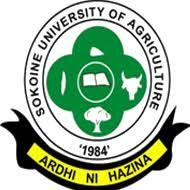 Applied Agricultural Extension, BSc. Range Management and BSc. Informatics, should report at the Solomon Mahlangu Campus (SMC) at Mazimbu directly from Msamvu bus terminal. Prospective students selected to join the rest of the degree programs should report to the SUA Main Campus (MC). All new students are required to participate in a mandatory orientation programme planned to starts on Monday, 30th October 2017. All admitted students should download admission letters and invoice at www.suasis.suanet.ac.tz through their SUASIS (SUA Student Information System) account. SUASIS can be accessed using the username and password provided to you during application. Each student Must upload a recent and high quality passport size photo on their web page before arrival for official use. This must be of the same quality as those used for passports or Identity cards.